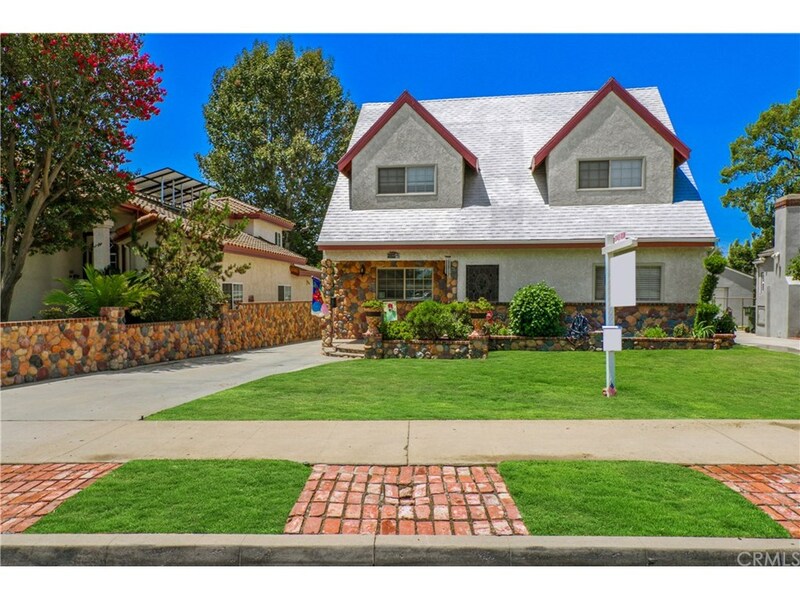 Beautiful well maintained house in North San Gabriel. Includes SOLAR PANELS to reduce electric cost. This 4 BEDROOMS 3 BATHS, and bonus room has much to offer. It has a welcoming entrance with gorgeous river rocks and flagstone that go throughout the exterior of the house and driveway. Offers 1 bedroom and 1 bathroom on the first floor and 3 bedrooms and 2 bathrooms upstairs. A spacious family room with fireplace and open floor plan, Kitchen and breakfast bar, and Dining room. House has stunning laminated wood floors, tile, and carpet. Central AC & heating, sprinkler system, window blinds, and stain glass window. Master bed, bath, and a walk-in closet with a surprise hidden room in back for extra storage, office, or playroom. All new copper pipes done 8 years ago. Back yard area has cover patio with water fountain, grass area and overlooks enclosed pool, spa, and built-in BBQ. Detached 2 car garage with extra storage area.